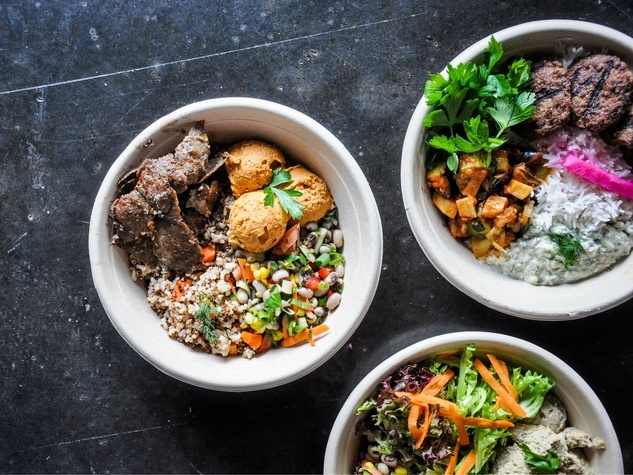 Mezze Me, a new fast-casual concept that highlights contemporary Mediterranean cuisine using locally-sourced ingredients, has opened at The Triangle. After graduating from college in Austin, Turkish native Moody Ugur operated two successful restaurants in Istanbul before returning to Central Texas to offer distinctive Euro-Mediterranean dishes. Ugur sources ingredients from area farmers and producers with help from farm-product distributor Farm to Table. Mezze Me specializes in customizable bowls. Diners build their own by choosing pita bread, spring mix, brown rice with quinoa, or basmati rice as a base and top it with a protein (beef and lamb doner, chicken doner, braised lamb, kofta balls, or falafel) and choice of mezze, which include hummus, roasted eggplant, spicy tabouli, and more. The final step is selecting a topping like sumac onion with parsley, crumbled feta cheese, Kalamata olives, tomatoes and cucumber, or dressings like yogurt dill or spicy harissa. The kitchen uses as many locally sourced and organic ingredients as possible. Bowls range from $7.85 to $9.25. The space is decorated with reclaimed elements and artwork from local crafters, and it offers free Wi-Fi and built-in iPad stations featuring popular games, movies, and educational apps to keep the kids entertained. Mezze Me is located at 4700 Guadalupe St., Suite 9. Hours are Monday through Saturday, 11 am to 9 pm.